International Journal of Research in Health Sciences,2016,4,3,73-76. 1Post graduate trainee, 2Associate professor, 3Post graduate trainee, 4Assistant professor, 5Professor. Department of Surgery, Regional Institute of Medical Sciences, Imphal, Manipur, INDIA. Angiomyolipoma is rare benign tumor which is composed of an intimate admixture of blood vessels, smooth muscle cells and fat hence the name. They occur at many sites, more commonly in kidney. They are seen in 25-50% of patients with tuberous sclerosis. The unilateral presentation is uncommon. Angiomyolipoma presenting as enlarged lump may mimic renal cell carcinoma, yet malignancy has to be ruled out. Excision is recommended for definite histological diagnosis in symptomatic patients and to prevent risk of haemorrhage and malignancy. We describe a 69 years old female with history of vague pain, right flank for 2 years with bimanually palpable painless mass in right flank. She has no history of tuberous sclerosis, haematuria and dysuria. Computerised tomography demonstrated a hypodense lesion measuring 95×54 mm in postero- lateral aspect of right kidney with linear hyperdense area and multiple rounded hypodense area in renal parenchyma. 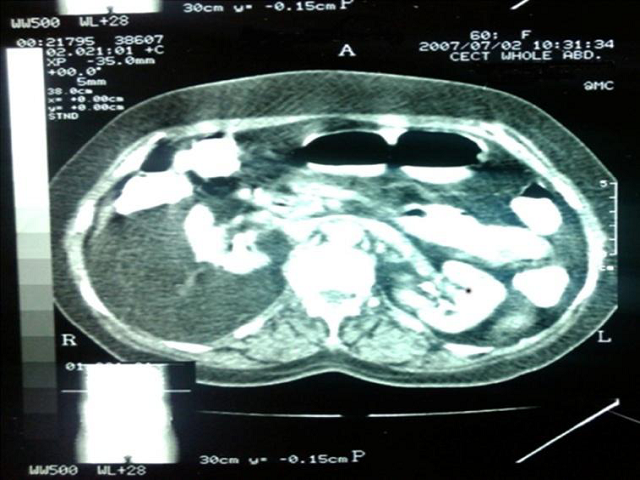 At right radical nephrectomy adrenal gland was completely normal. Histology shows perinephric angiomyolipoma with multiple microscopic angiomyolipoma in the renal parenchyma with peculiar growth pattern completely encompassing entire kidney ,capsule well preserved. CT scan showing hypodense mass in right kidney.